One way to cultivate joy in our giving is to meditate on various Scriptures, including Matthew 13 where the man finds the treasure hidden in the field and then “in his joy, he sold all that he had” to obtain the treasure. The key is “in his joy.” If we fail to see this, we could feel sorry for the man, saying, “It cost him everything.” But we aren’t to pity this man; we’re to envy him, and follow his example! His sacrifice pales in comparison to his reward—which is the key to his joyful attitude. 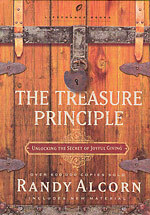 Likewise, realizing we are storing up treasures in heaven by giving is the key to our joyful attitude. Giving is a duty, yes, but it is far more. It is an incomparable source of joy. Like the man finding the treasure, we should consider the costs-to-benefits ratio—the benefits far outweigh the costs. The traveler made short-term sacrifices to obtain a long-term reward. “It cost him everything he owned.” Sure, but it gained him everything that mattered. The man wasn’t exchanging lesser treasures for greater treasures out of dutiful drudgery, but out of joyful exhilaration. He would have been a fool not to do exactly what he did. Likewise, in Matthew 6 Jesus tells us that our giving is in our own best interests: “store up for yourselves treasures in Heaven.” He’s talking about deferred gratification. The man who finds the treasure in the field pays a high price now by giving up all he has—but soon he’ll gain a fabulous treasure. As long as his eyes are on that treasure, he makes his short-term sacrifices with joy. The joy is present, so the gratification isn’t entirely deferred. Present joy comes from anticipating future joy. By analogy, have you ever saved money for a future vacation, and taken present joy in anticipating what’s ahead, even though for the moment you’re cutting back on things you enjoy, such as going to the coffee shop or out to eat? The future joy looms larger than the present one you forgo. Athletes do this when training for a race. What they hope to win outweighs the momentary sacrifice. I use this example in The Treasure Principle: Suppose I offer you one thousand dollars today to spend however you want. Not a bad deal. But suppose I give you a choice—you can either have that one thousand dollars today or you can have ten million dollars one year from now, then ten million more every year after that. Only a fool would take the thousand dollars today. Yet that’s what we do whenever we grab onto something that will last for only a moment, forgoing something far more valuable that we could enjoy later for much longer. Now, let’s consider the present pleasure we would take in anticipating what will be ours one year from now, and every year thereafter. And if this seems like a far-fetched example, on the contrary it understates the case. When we give to God’s work today, we invest in his kingdom—and needy people and Bible translation, ministry to prisoners, the disabled, hungry children, diseased people—all in Christ’s name. That investment will yield dividends for all eternity. When we decide whether to keep something or to give it, we should ask how the decision will pay off not just ten days or ten months from now, but ten thousand years from now. God says “in your presence is fullness of joy, at your right hand are pleasures for ever more” (Psalm 16:11). By forgoing short-term pleasures and giving instead, we secure long-term pleasures in God’s presence. When we contemplate that reality, when it becomes real to us (and it certainly can and has for countless people), we are infused with joy in giving. The more we give, the more we delight in our giving—and the more God delights in us. Our giving pleases us. But more importantly, it pleases God. Some would say, “You shouldn’t give if you aren’t giving cheerfully.” They cite, “God loves a cheerful giver” (2 Corinthians 9:7). But God also loves a cheerful parent, which doesn’t mean that if you can’t take pleasure in changing your child’s diaper you shouldn’t! So it doesn’t mean we should give only when we’re feeling cheerful. The cheerfulness often comes during and after the act of obedience, not before it. As in parenting, the sacrifices we make for the ones we love ultimately bring satisfaction. God delights in our cheerfulness in giving. He wants us to find joy. He even commands us to rejoice (Philippians 4:4). What command could be a greater pleasure to obey than that one? But if we don’t give, we’re robbed of the source of joy God wants for us. The Macedonian Christians understood the joy of giving: “Out of the most severe trial, their overflowing joy and their extreme poverty welled up in rich generosity” (2 Corinthians 8:2). Eric Liddell said, “When I run, I feel God’s pleasure.” When I give, I feel God’s pleasure. There’s no better feeling. God’s grace to us is the lightning, our giving to Him is the thunder. We give, because He first gave to us. He went to church, and walked about the streets, and watched the people hurrying to and fro, and patted children on the head, and questioned beggars, and looked down into the kitchens of houses, and up to the windows; and found that everything could yield him pleasure. He had never dreamed that any walk—that anything—could give him so much happiness. Some people laughed to see the alteration in him, but he let them laugh, and little heeded them.... His own heart laughed, and that was quite enough for him. And it was always said of him, that he knew how to keep Christmas well, if any man alive possessed the knowledge. 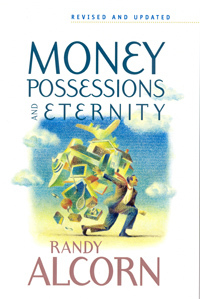 For more, see our resources on money and giving, as well as Randy's related books, including The Treasure Principle. 10% is not some lofty goal, just a starting place, but starting is important.